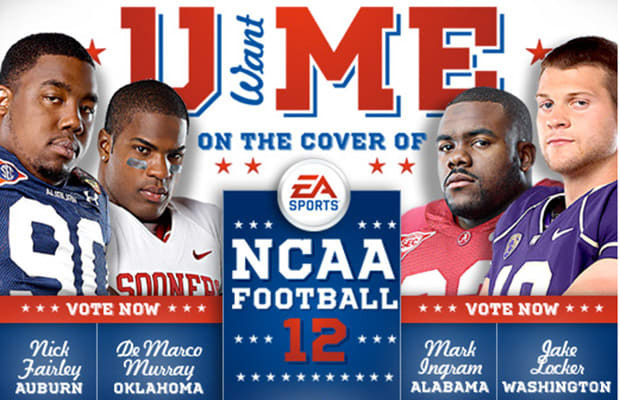 Starting today, you can vote on the game&apos;s Facebook page to decide which college football standout gets to grace the cover of NCAA Football 12. The candidates for cover boy are Auburn defensive tackle Nick Fairley, Washington quarterback Jake Locker, Heisman Trophy winner and Alabama running back Mark Ingram, and Oklahoma running back DeMarco Murray (we’re guessing Cam Newton&apos;s dad wanted too much money Cam Newton turned EA down). Voting runs until April 4, and the winner will be announced by EA Sports on April 19.